Ed Barrow: The Bulldog Who Built the Yankees ‘ First Dynasty, published by the University of Nebraska Press in April, 2007, is the first book-length treatment of Barrow’s life. The book can be ordered directly from the University of Nebraska Press’s web page for the book. More information and other online ordering options are available at the author’s website. The following excerpt is from chapter 16, “Rebuilding a Dynasty” and relates the story of how Barrow returned the Yankees to pre-eminence after a couple of down years in 1924 and 1925. As he argued in the story of his years running General Motors, American industrialist Alfred Sloan understood that “the big work behind business judgment is in finding and acknowledging the facts and circumstances . . . in their continuously changing forms.” The success of the Yankees’ dynasty resulted in large part from Ruppert and Barrow adapting their Yankees player acquisition and development strategies to best fit the prevalent conditions. At the start of the 1920s, Barrow improved the Yankees’ roster by buying up major league talent from the league’s only willing seller, Huston’s needy friend Harry Frazee. With the exhaustion of this source, the Yankees moved on to the other most fertile source of major league–ready talent, the high minor leagues. As has been mentioned, the circumstances surrounding the high minors changed around 1920 with the elimination of the draft. The minor leagues now effectively controlled the promotion of their ballplayers, and the subsequent bidding wars favored the big-spending clubs. The situation facing a team needing to rejuvenate its roster is surprisingly analogous to the modern system of free agency. Through successful scouting a club first needed to establish which players could help it the most. Once identified, a team must then be willing and able to spend the money necessary to acquire them. Building a relationship—either with the player in the case of modern free agency or with the minor league operator in the 1920s—also offered an opportunity for competitive advantage. The Yankees excelled in all areas: Barrow had assembled an excellent team of scouts, the team was profitable, and ownership was willing to spend; and Barrow, Huggins, and the scouts had an extraordinary depth of relationships with minor league baseball owners and managers. Despite the influx of better-heeled owners in the aftermath of the Federal League war, Ruppert remained one of the handful with significant assets outside their franchise’s value. Of course, a number of owners, such as Charles Comiskey, Charles Ebbets and Frank Navin, had accumulated substantial wealth simply through their team ownership. As table 7 demonstrates, the Yankees had more to spend because the team earned more than any other franchise, and the Yankees’ owners did not distribute their profits; they reinvested them in the club. Four American League clubs distributed at least $200,000, reducing the funds available for investing in minor league talent. From 1920 through 1924, the Yankees plowed over $1.6 million back into the franchise; no other American League team retained even $700,000 and no National League club over $900,000. Ruppert made this capital available to Barrow, who spent much of it acquiring minor league talent. In early 1925 Huggins’ close friend and Yankees scout Bob Connery purchased a controlling interest in the St. Paul American Association franchise. Connery brought in Huggins as a partner, and the latter purchased a one-third interest in the team in his sister’s name. The precise relationship between the Yankees and the St. Paul Saints remains murky. Connery naturally retained his close relationship with the Yankees and happily accepted New York players on option. He also typically offered the Yankees a first look at his players. But the relationship benefited Connery much more than the Yankees; New York paid him huge prices for his players, and none became top stars. Ruppert later grumbled that he spent around three hundred thousand dollars buying players from St. Paul—the Yankees’ financial records support this assertion—for very little return. Barrow and his scouts did not distinguish themselves when buying players from the Saints, and one can only wonder at Huggins’ influence in these acquisitions. He had an obvious conflict of interest, and Barrow must have known of his ownership stake. Following the success of the Earle Combs purchase, Barrow looked to reenergize his squad by infusing additional young stars. In 1925 he traveled to St. Paul to negotiate with Connery for the purchase of shortstop Mark Koenig. Connery drove a hard bargain; Barrow eventually agreed to a price of $50,000 and six players (the Yankees valued the players at a total of $25,000: the six consisted principally of players the Yankees controlled but who were not on their active roster). Barrow also purchased right-handed pitcher Herb McQuaid for around $30,000. Koenig developed into a capable regular, and his purchase seems relatively defensible: in 1925 as a 22-year-old he had hit over .300 with 11 home runs. McQuaid, however, never panned out. In 1925 he was already 26, and although he finished 14-5, his ERA was a more mundane 3.81 (and in 1924 it had exceeded 5.00). In his final notable purchase from St. Paul that season, Barrow acquired catcher Pat Collins for $15,000. Collins had spent the early 1920s as a backup for the Browns before St. Paul acquired his rights. With the Yankees, Collins provided two years of adequate service. Much more significantly, Barrow bought second baseman Tony Lazzeri from Salt Lake City for $50,000 and five players. Lazzeri had hit 60 home runs in the long-season Pacific Coast League, but Krichell remembered watching him struggle when he had scouted him. Nevertheless, Krichell was convinced he would be a star in the Major Leagues and called Barrow with the news. “How in hell can you like him when you’ve just told me he strikes out 14 times in six games?” Barrow demanded. Barrow wanted confirmation before he agreed to Salt Lake’s exorbitant price. He practically ordered Bob Connery—no longer a Yankees employee but still receiving large payments for his players—to cross-check Lazzeri. Barrow also sent Ed Holly to validate Krichell’s enthusiasm. Both backed him up, and Barrow anted up to secure him. 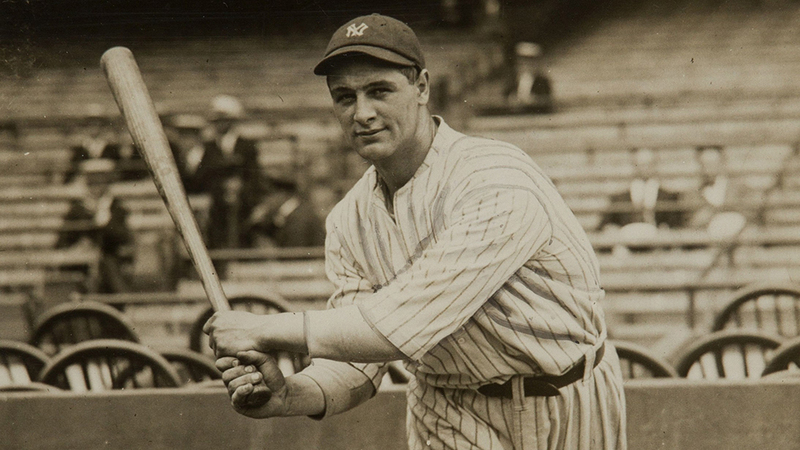 Lazzeri proved an excellent investment and turned in a Hall of Fame career for the Yankees. As insurance for Lazzeri, Barrow claimed reserve infielder Spencer Adams on waivers from Washington. Barrow also picked up one lesser-known Minor League infielder from Hartford for $7,500, shortstop Leo Durocher. Durocher was generally regarded as one of the Minor Leagues’ best fielders but not yet ready for the Majors. Barrow optioned him to Atlanta for 1926. Barrow and Huggins had intelligently and successfully, albeit expensively, turned over much of the offense since the team’s last pennant in 1923. Offseason purchases Collins, Lazzeri and Koenig now manned catcher, second base and shortstop, respectively. After taking over at first base midway through 1925, Gehrig launched his legendary career. The outfield consisted of veterans Ruth and Meusel flanking sophomore star Combs. Barrow did not feel the need to revamp the pitching rotation, which still consisted of 1923 mainstays Hoyt, Jones, Pennock and Shawkey, along with Shocker, the previous offseason’s acquisition. For several years the Yankees had been sending some of their veteran players, including Ruth, to Hot Springs, Arkansas, for a couple of weeks of “boiling out” prior to the start of spring training. Over the winter Barrow announced that the club was suspending this policy and perk. In concept, the baths and hot springs were to help the players recover from a winter of inactivity. But Ruth’s bout with illness at the start of 1925 and the overall poor showing of the team’s veterans made the Yankees’ brain trust doubt their supposed health benefits. Many sportswriters expressed their skepticism of the Yankees’ offseason makeover. Barrow had a complex relationship with the New York press, who often referred to him as “Cousin Ed” or “Cousin Egbert.” He was habitually depicted as mean, caustic and domineering by the press, some of whom grew to dislike and resent his presence. Others readily ingratiated themselves to remain closer to the story. The rejuvenated Yankees jumped out to a quick start and soon threatened to runaway win the pennant. The team stood at 12-3 at the end of April and maintained a strong pace through July, which they wrapped up at 66- 34. The Yankees slumped to 25-29 during August and September, allowing some semblance of a pennant race to develop. In early September, Barrow and Huggins arranged to pick up veteran pitcher Dutch Ruether on waivers from Washington for the four-thousand-dollar waiver price plus two players to be named later (one, Garland Braxton, would lead the league in ERA in 1928 before fading away). With Ruether on board, the Yankees held on to capture their fourth pennant on Barrow’s watch. The season was not without a couple of interplayer scrapes. In September during an exhibition game with Baltimore, Ruth and Koenig traded punches, but the squabble had no lasting effect. For the upcoming World Series, the Yankees would face the St. Louis Cardinals, who under Branch Rickey, another de facto general manager, had just won their first pennant. One of Barrow’s biggest headaches, which he fortunately dealt with fairly often, was managing the distribution of World Series tickets. At that time baseball clubs made a conscious effort to keep tickets out of the hands of scalpers, usually with only limited success. After selling the 25,000 reserved and box seats, Barrow warned that the team knew who had received them and it would trace those that fell into the hands of speculators. Another ticket problem surfaced when the Series went to a seventh game. The Yankees’ initial book of tickets contained tickets for Games 1, 2 and 6. Most of the boxes for Game 7 were already reserved for baseball executives and other dignitaries, but Barrow and his staff had to supervise the distribution of nearly 60,000 tickets for the game. The Series itself was highly suspenseful. The teams split the first two games in New York. The Yankees won two of the next three in St. Louis to bring the Series back to Yankee Stadium with a 3–2 lead. The Yankees lost Game 6, setting up the deciding game on October 10. Game 7 ended with the Yankees behind 3–2: with two out in the ninth, Babe Ruth was caught trying to steal second base. Herb Pennock, who had won Games 1 and 5 was the Yankees’ star, but Grover Cleveland Alexander, the aging legend who had won two games and saved the last, stole the spotlight in leading the Cardinals to their first world championship. When the players divvied up their World Series shares, they voted reserve third baseman Mike Gazella, who had been active most of the season but played only sparingly, a one-quarter share. Gazella protested this slap and complained to Huggins. After Huggins begged off getting involved, Gazella approached Barrow. Barrow saw the merit in Gazella’s complaint and revisited the issue with the players, whom he persuaded to increase Gazella’s share to one-half. Barrow advised Gazella to accept this compromise, but Gazella, believing he deserved a full share, still balked and further protested to Commissioner Landis. Landis sided with Gazella and ordered the Yankees to allot him a full share. Coincidentally or not, in the future the Yankees became particularly inclusive and generous in the allocation of their World Series money. Despite the Yankees’ return to the American League title in 1926, Barrow and Huggins were typically unsatisfied with the status quo. After the Minor League meetings in December, Huggins announced the team’s needs for the upcoming season as “two pitchers, one infielder and one outfielder.” Joe Dugan was slowing at third due to knee problems, and Huggins wanted a capable fourth outfielder. Despite their professed desires, the Yankees made surprisingly few moves. During the offseason they made no trades or Minor League purchases of lasting significance. In a couple of minor deals, they sent out-of-favor infielder Aaron Ward to Chicago for a reserve catcher and an infielder, and aging pitcher Sam Jones to St. Louis for a mediocre reserve outfielder and mop-up pitcher. As a potential replacement for Dugan, Barrow shipped forty thousand dollars to St. Paul for Julian Wera, who unfortunately never lived up to expectations. The Yankees’ key acquisition for 1927 came in the midst of the 1926 season. There are multiple stories behind the signing of Wilcy Moore, and their telling sheds light on Barrow’s personality. As he aged and assumed a more strictly administrative role, Barrow feared his player-evaluation skills would be forgotten. He constantly reminded baseball writers and enthusiasts of his “discovery” of Honus Wagner. Barrow also liked to claim he had unearthed Moore, who became a vital component of the legendary 1927 team. In his autobiography Barrow relates how he noticed Moore’s 30-4 1926 season in the lower minors at Greenville while researching minor league records. He supposedly asked scout Bob Gilks about Moore and was told: “He can’t pitch. And anyway, he says he’s 30 but he must be 40.” Barrow, however, insisted the Yankees buy him—anyone who can win 30 games, even in the relatively low minors must have some potential. The actual story is much less flattering to Barrow. Yankees bird-dog scout and Minor League umpire Jack Walsh recommended Moore to Barrow in the middle of the 1926 season after Gilks passed on him. Barrow wisely sent Gilks back for a second look, and in August, with his record at 25-2, the Yankees purchased Moore for $4,000. Barrow, however, refused to honor his agreement to pay Walsh a finder’s fee and claimed credit for Moore’s discovery. Walsh later appealed to Commissioner Landis, who ducked the controversy by pleading that he did not rule in cases that did not stipulate a specific finder’s fee. With this avenue closed, Walsh filed suit after the 1927 World Series asking for a $10,000 fee. Prior to trial, Barrow and Walsh reached an undisclosed settlement. The frustrated Walsh claimed he had also recommended several other future big leaguers, including Dale Alexander and Red Mahaffey, to Barrow, but Barrow had failed to follow up. After the settlement Walsh believed that Barrow blackballed him from baseball. (This is a fairly dubious accusation: Barrow had enough issues of his own to worry about and little control over the business of Minor League operations, in any case.) In 1930 Walsh sent Barrow a letter essentially threatening blackmail: if Barrow did not hire Walsh as a scout—and Walsh argued he was a very good one—he would release the documents from the Moore case to the press, which he claimed would embarrass Barrow. When Barrow brushed him off, Walsh carried his crusade to Ruppert. In a long hand-written diatribe against Barrow, Walsh touted his case and denigrated Barrow as an “untrustworthy wretch.” Ruppert also ignored the embittered Walsh. Walsh next tried to generate some newspaper interest in his vendetta, at which point Barrow had had enough. He sent a letter to Walsh with the warning: “[If you do not stop the campaign] in which reflections are cast upon my character and integrity, complaint will be made to the Postal Authorities and your letters turned over to them as evidence for criminal action.” Upon receipt of this letter and little reaction from the baseball establishment, Walsh apparently finally gave up the fight. Excerpted from Ed Barrow: The Bulldog Who Built the Yankees’ First Dynasty by Daniel R. Levitt, by permission of the University of Nebraska Press. Copyright (c) 2008 by Daniel R. Levitt. Available wherever books are sold or from the University of Nebraska Press (800) 755-1105 and on the Web at http://www.nebraskapress.unl.edu.